The brethren of Silverdale Lodge No 6926, all decided that they wanted to offer support to the village of Silverdale, the home of their Masonic hall. 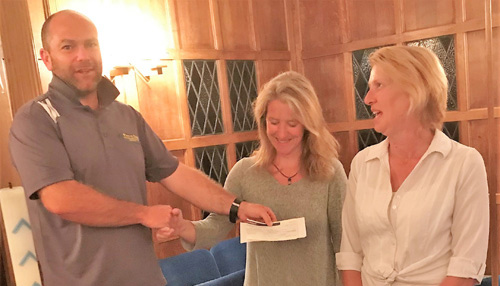 Carl Horrax presenting a £250 cheque to Fleur McCain (left) and Angela Wood. This they were able to do by presenting Mrs Angela Wood and Mrs Fleur McCain, who are members of the Silverdale Field Day committee, with a cheque for £250. Angela had not been aware of all the charitable work undertaken by Freemasons and on the night of the presentation, it was in fact the first time she had been inside the Masonic Hall in Silverdale. Thanking the WM Carl Horrax and the brethren of Silverdale Lodge, Angela thought that the donation would be used to buy new bunting. Overall, this is a good example of Freemasonry having a positive impact on a local community. Well done to all concerned. Article written by Paul Thompson. Photograph courtesy of Chris Brown.